Blog > Designers > Indie designer of the week: Stephen West! Indie designer of the week: Stephen West! Stephen West is his name, funky and fresh knitting designs are his game. Read more about this iconic designer’s influences, methods, and inspirations at LoveKnitting! Click here to see all of his fabulous patterns. 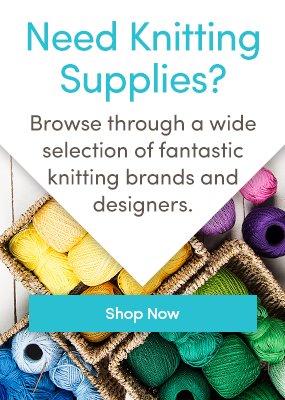 How did you catch the knitting bug? My friends taught me in high school when I was 16 years old. I learned to knit in the dark backstage during a tech rehearsal for a musical. It was a horrible first start, but I was immediately intrigued so I bought a book and taught myself the rest of the basics. I get a lot of inspiration from traveling and luckily I get to travel a lot to teach knitting workshops. I love soaking up the colorful atmosphere of cities like Reykjavik and Amsterdam. I also enjoy looking at design and fashion boutiques in every city I visit to see the play of different shapes and colors combinations. I create most of my designs while I knit instead of pre-planning every garment so I find a lot of inspiration in the simple rhythms of colorwork and shaping fabric. What inspired your love of brioche? I took a two-color brioche class from my neighbor Nancy Marchant a couple years ago and I was immediately hooked. I admired the stitch for several years before I tried it. Once I dedicated a couple hours to the technique, it became much easier than I imagined. I’m obsessed with the spongy soft fabric and colorful reversibility that the brioche stitch yields. Brioche is the stitch of 2015! Above: Bundled in Brioche scarf – FREE pattern! Do you have favorites among your own designs? My designs are like my kids and yes, I do have favorites. I love wearing my striped Dotted Rays shawl and Color Craving shawls. My fuzzy white and pink Penguono jacket is also a favorite. Are there any of your designs you’d say were suitable for a beginner? Absolutely! My first design, Boneyard Shawl, is a great beginner project. The Purl Ridge Scarf, Botanic Hat, Garter Squish Blanket and Urbana scarf are all ideal beginner projects with simple stitches and minimal shaping. I would love to see Björk or Ellen Degeneres rock a Westknits design! Björk is a fellow bright yellow lover so I would totally dress her in the Madelinetosh Edison Bulb colorway. I would be a blend of super soft wool mixed with fuzzy mohair and sparkle in a super bright color like Edison Bulb because I believe every knitter needs to have a pop of color, a fun texture, and sparkle on them at all times. So you have any favorite color combinations? My color cravings are always changing, but I LOVE pops of color with neutrals like neon yellow and grays. Recently, I’m craving bold solid primary colors like royal blue, punchy red, and bright green. I’m also using a lot of solid black combined with white and other color pops in my designs for spring and summer. What’s next for Stephen West? I’m teaching this spring in the Netherlands, Paris, and London and I’m working on dozens of new designs for spring and fall. I recently started the Westknits show on YouTube hosted by Stephen Eastknits. He’s very colorful, opinionated, and full of genius ideas. Stephen Eastknits is also working on a series of music videos for knitters so look out! Garter until the end of time. Thanks, Stephen! If you want to see the rest of Stephen’s pattern library, click here. Last updated: August 7th, 2015. 5 Responses to Indie designer of the week: Stephen West! Beautiful work. I really like the lost and found poncho! I am with Gert. The Lost and Found Poncho is pretty neat, and Mr. West’s work is beautiful. I especially like his Sun Satchel and shawls/scarves. He is my kind of designer! Do not know why but men who knit fascinate me. Maybe it is their ‘take’ on design. Maybe the difference of a man’s perspective? Whatever it is, I fail to be bored. Okay, more things to add to my long list of knitting. Just cannot knit fast enough for my voracious appetite for interesting patterns! I’ve admired Stephen West for absolutely ages, really great to read this blog post about him. I dabble in designing my own stuff but it’s all really basic – I dream of being able to design amazing creations like he does! The Lost and Found Poncho along with Exploration Station Shawl are 2 of my most favourite Stephen West patterns. This man has a great perspective on women’s fashion and they are so wearable. Haven’t seen anything like these in Australia!! Irresistible. Saw Exploration Station on Facebook and now own it and Askews Me. Now I’m looking forward to fall.